What Is a Chain Wall? Chain wall foundations, also called filled stem wall foundations, are a form of raised foundation that help elevate buildings above flood level. Chain wall foundations can either be built on site or a precast concrete structure can be installed as a unit. In areas prone to flooding, installing a chain wall may be required under code. Chain walls are extensions of standard house foundations. Chain walls look like a cage of concrete pillars. They sit on a standard foundation slab and, after installation, compacted structural fill or compressed dirt, is pumped in to give further support to the floor slab. Precast chain walls arrive intact. The contractor creates a space in the ground and the frame is lowered in by crane. There is no filling and no wait time; according to Kenner Chain Walls, a specialty contractor, installation may take as little as one hour. Precast chain walls are used only in smaller structures such as utility shelters and generator housing. Their advantage is in cost savings, speed and simplicity, plus you can stack them to raise the structure over flood level. Filled stem walls are suitable for houses and provide additional strength. Louisiana State University also notes that an elevated structure may look more impressive. The main use of chain walls is in flood control. Some precast chain walls can be stacked as high as 20 feet above the base slab, thus raising structures out of the way of floods. Chain walls for houses elevate the structure and, according to the Federal Emergency Management Agency, divert flood waters. FEMA also notes that builders using chain walls should clarify that they're using a filled chain wall for flood control and not as a crawl space, since building codes require gaps for crawl spaces. 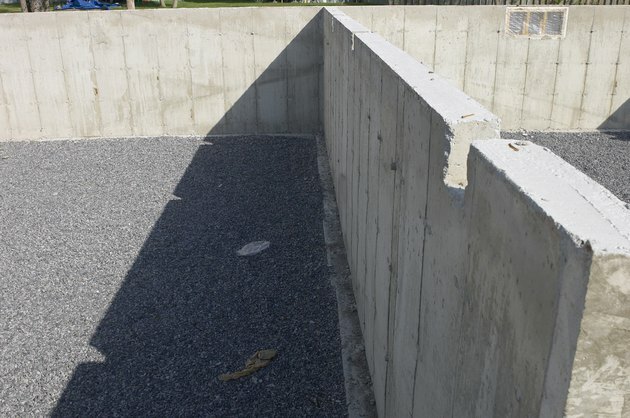 What Is a Stem Wall on a Concrete Foundation?